The Gaelic Park Sports Centre (Irish: Páirc na nGael), often abbreviated Gaelic Park, is a multi-purpose outdoor athletics facility, located at West 240th Street and Broadway in Riverdale, Bronx, in New York City in the U.S. state of New York. Since 1926 the grounds has been used as the venue for Gaelic sports in New York, and since its purchase by Manhattan College in 1991 it has hosted numerous American college athletic events. 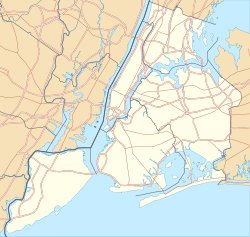 Located just west of Broadway and south and west of Van Cortlandt Park in the northernmost part of the Bronx just south of the city border with Westchester County, Gaelic Park was purchased in 1926 by the Gaelic Athletic Association of Greater New York. It has been given a few different names over time including Innisfail Park, but since the 1950s it has gone by its current name, Gaelic Park, a reflection of the park's decidedly Irish flavor. The park includes a playing field and dance hall. In addition to hurling and football matches, a number of other sporting events take place at Gaelic Park. There are also concerts and dances that feature Irish music both old and new. Beginning with "Summer '69" and continuing into the early 1970s, rock concerts were also held there, including the Association, Beach Boys, Gary Puckett and the Union Gap, Eagles, Pete Seeger, Rascals, Irish Rovers, Four Tops, Grateful Dead, Chicago, Edgar Winter, Johnny Winter, Jefferson Airplane, Black Oak Arkansas, Allman Brothers Band, Ten Years After, Yes, Emerson, Lake & Palmer, Mountain, Humble Pie and Deep Purple. Gaelic Park was bought by the Gaelic Athletic Association of Greater New York (GAA) in 1926. It started off as a very rough pitch that served as a social center for the many Irish immigrants to The Bronx. With the absence of film centers and other entertainment complexes, hurling at the park was the main entertainment. The GAA ran the park for about 10 years until it was forced into bankruptcy, after which the city took over the land. The property was then leased again in 1941 to John "Kerry" O’Donnell, who with the help of his family and friends ran the park, dance hall, and tavern. For several years, it was called "Croke Park" after the key GAA park in Dublin. The park was taken over by Manhattan College in 1991, and currently goes under the official name of The Gaelic Park Sports Center. The college has kept up the traditions of Gaelic Park, as well as doing some significant renovations, and now also uses it for home games of lacrosse, rugby, soccer, and softball. In early 2007, a $3 million renovation of Gaelic Park began. FieldTurf was laid out to replace the natural pitch, which made it more durable for both American and Gaelic sports. In addition, facilities for softball were improved, and the installation of stadium lighting made night games possible. This page was last edited on 30 March 2019, at 23:59 (UTC).